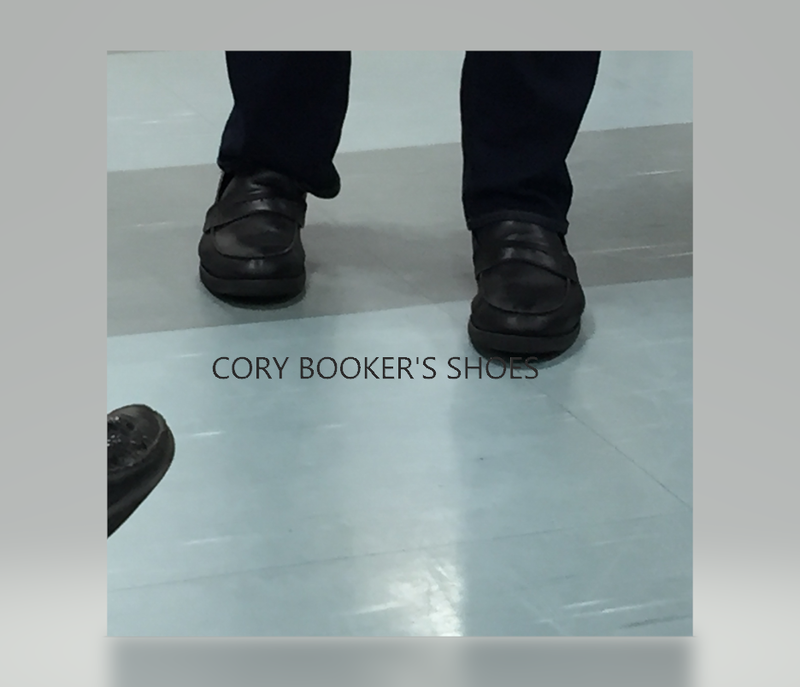 CORY BOOKER'S SHOES as he wore them April 7 at the McConnell Center in Dover. Welcome to Decoding the Vibe where I take an occasional break from Joyful Musings to tell it like it really is as the first-in-the-nation primary parade of candidates comes to town. I report on who I meet, who I observe, who I laugh at and who laughs at me. And while I hope to cover some political angles, my intent is to invite you to join me before the rhetoric begins, before the backs straighten, before the lights go on. Join me behind the scenes. Watch the mic checks. Meet the people who turn out to meet the presidential candidates in Decoding the Vibe. John Delaney, Kirsten Gillibrand and Cory Booker are the three candidates whose spiels, stump speeches, job interviews I want to tell you about today. And maybe take a picture of their shoes – or yours. Both Delaney and Gillibrand spoke at Flight Cafe in Dover and the absolute best part of listening to their verbiage was scoring the ginormous oversized chair closest to the stage. Listening to presidential candidates while sipping tea in a pillow-like chair is, truly, the way to go. 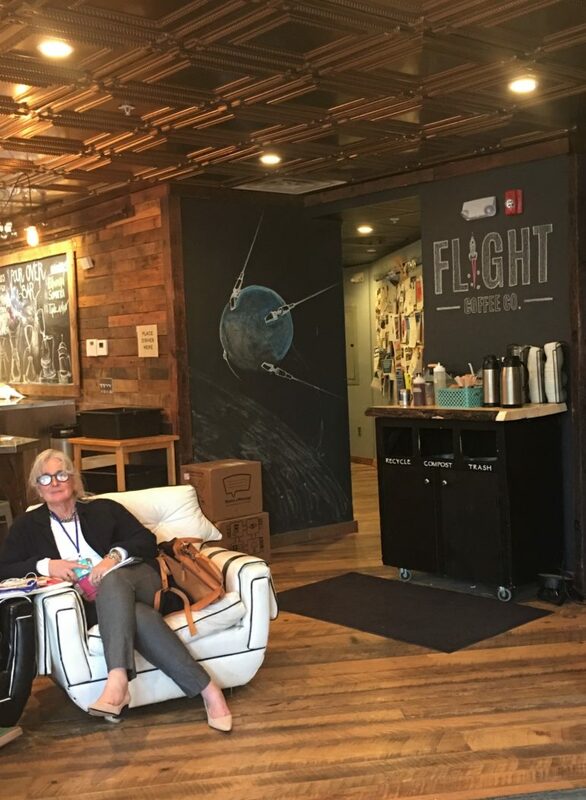 Wearing her special Decoding the Vibe glasses, Susan Dromey Heeter is pictured at the Flight Coffee shop in Dover making sure she is early to get the comfy chair. Delaney arrived wearing a fleece vest. His vibe is funny, energetic and corporate. A graduate of Columbia and Georgetown, he is the father of four daughters. When he asked whether Dover’s McConnell Center was named after Mitch McConnell, I liked him; he brought some levity to his stump speech and aside from sitting in my cozy chair, there’s nothing better than a laugh. The vibe of the event did take a turn when it came to health care. 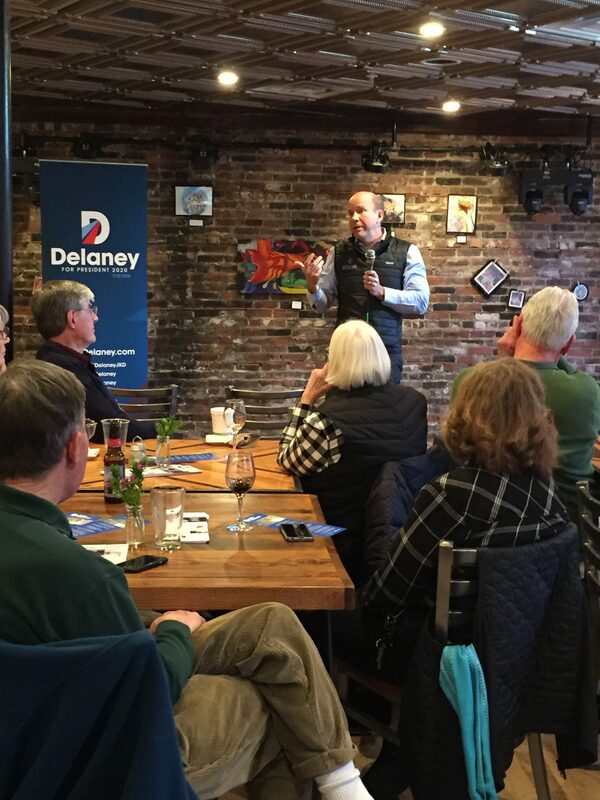 And while Delaney spoke about his dedication to a “life of service” a dark cloud emerged when he spoke of his plans, his ideas. The woman who asked looked crestfallen when he provided his solution; as I looked around the room, this event invited an older crowd. The vibe: worried, frightened, really scared when the details of health care did not seem to align with the hope and clarity so many people are desperately looking for. And while Delaney has seen Bruce Springsteen over thirty times (Delaney does hail from New Jersey), even the Boss connection did not put me over the top. Kirsten Gillibrand also spoke at Flight and knowing about those ginormous chairs, I arrived early to score the ring side cushy seat. Gillibrand invited a younger crowd than Delaney. I spoke with Joe, 19, a student at Great Bay Community College, Quinn, 20, from the University of New Hampshire and Dave, 20, a continuing ed guy. I asked them what brought them out and they remarked, “It’s better to learn it here and good to get involved.” They, too, come to the first-in-the-nation events to gather their own personal data, all while sipping on a can of Pabst Blue Ribbon. Gillibrand impressed. A Dartmouth graduate, she speaks Mandarin and exudes energy, intelligence and toughness. She provided far more specificity, examples in her speech than other candidates and really seemed to listen to the questions, including one from a red-haired boy who she directed to “Stand up!” She then gave him the microphone. A mother of two boys, Gillibrand’s guidance appeared strong, direct, kind. Her answers to reproductive rights, climate change, immigrant rights were aligned with most candidates – nothing new to report but the vibe of the event: firey, confident, funny and smart. 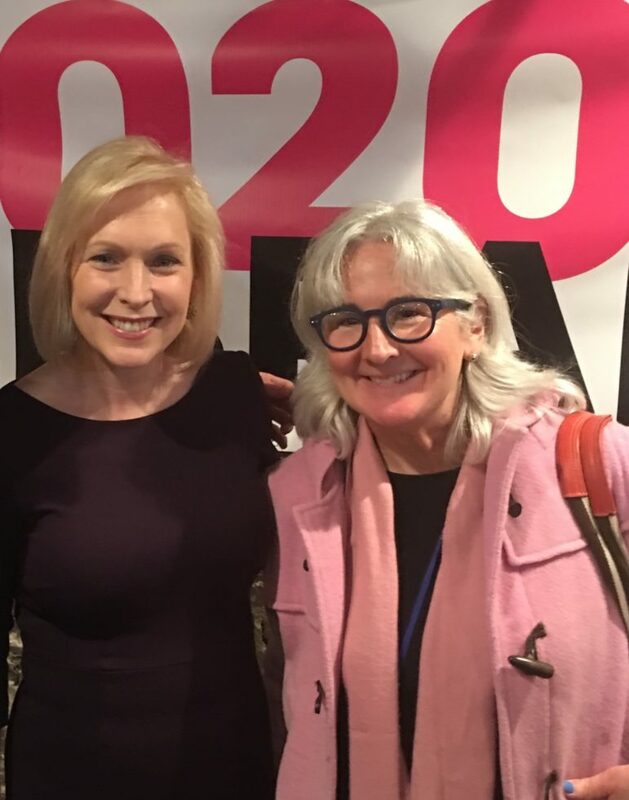 She remarked, “A smart younger woman is the kryptonite to Trump.” When I met one of her assistants, the young woman in charge of the music and live stream, I sensed that Gillibrand surrounds herself with equally charged people. I left the event far more awake than I generally am on a Friday evening. I deeply enjoyed the energy and noticed Gillibrand did not rush off, rather, stayed to chat with those with questions. 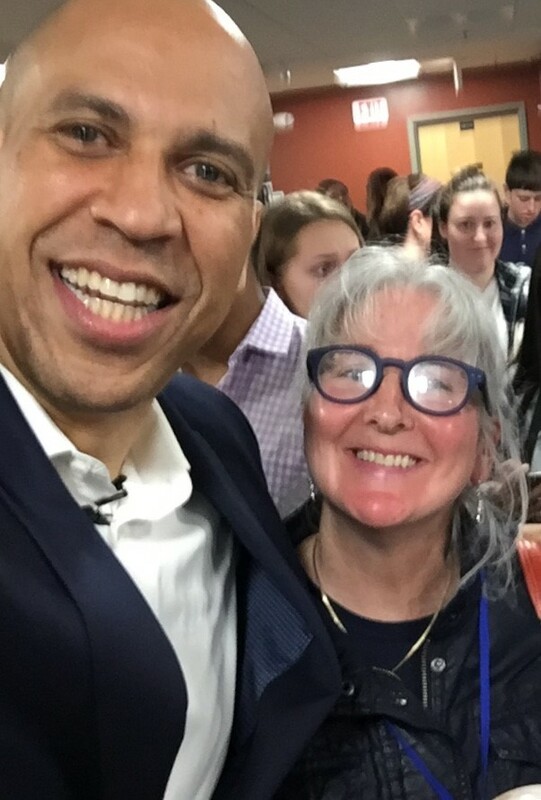 Last Sunday afternoon, I met Cory Booker at Dover’s McConnell Center which is NOT named after Mitch. Cory is deeply kind, sweet, so loving; he sported black comfortable loafers and arrived with a vibe of pure Leo Buscaglia. He preaches rather than speaks and honestly, is just so deeply kind I fell in love. His vibe is inclusivity, hugs, a warm spirituality that envelopes. When the woman sitting next to me asked about her gender fluid children and requirements for gender disclosure, her hands shook; I could not help feel her fear, her vulnerability. But Booker simply answered and provided deeply kind assurance. The Booker vibe is far more gentle than any others. When I asked him if he speaks Spanish (he does), I found him deeply personal and charismatic. The vibe of the event brought a vulnerability, questions were less about global issues, more about children and education. Booker’s vibe felt open and inclusive, reassuring and charismatic. There is nothing like being around people running for the office of leader of the free world and nothing like decoding the vibe around their speeches, their presence, their aspirations. My take away from the three latest? Delaney: energetic billionaire, Gillibrand: brilliant kryptonite, Booker: warm diplomat. InDepthNH.org takes no position on politics, but encourages diverse viewpoints. The opinions expressed here belong solely to the writer.